When voter files first came to prominence for practitioners and researchers, many were just what the name suggests – lists of registered voters. However, as research and targeting using the voter files has become more widespread, most vendors try to provide coverage of all U.S. adults, including those not registered to vote, in their files. Because the core component of the files is a combination of official state lists of registered voters, vendors have sought out commercial databases – available from sources such as credit rating agencies – to locate Americans missing from state voter rolls. How well the files cover the unregistered population is potentially an important consideration for those who wish to use the files to locate and attempt to persuade the unregistered to register. Coverage of the unregistered is also important if the file is to be used for describing or conducting surveys of the general public and not just voters. To date, pollsters have used the files as a source for sampling the registered voter population, but files that make an effort to cover the full population could theoretically have utility as sampling sources for the general public. To the extent that they accurately represent the non-registered population, such files provide the researcher with the opportunity to use information in the files to guide the sampling. For example, the non-registered and registered voters with lower turnout propensities could be oversampled for research aimed at understanding the less engaged. To assess how well the files cover the unregistered, the match rates and composition of the matched cases was compared for panelists who report being registered to vote and for those who say they are not registered or are not sure if they are registered. 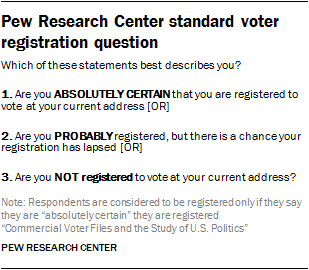 In Pew Research Center surveys, respondents are considered unregistered if they report not being registered or express uncertainty about their registration. Among members of the American Trends Panel, those considered unregistered are much less likely to have been matched by the files. As noted in the previous chapter on the matching process, the match rates for the self-reported unregistered varied from a low of 12% to a high of 54%, depending on the vendor. Not surprisingly, panelists who were certain about their lack of registration had the lowest rates, ranging from 4% to 50% matched, with those who said they were probably registered but not certain falling between the certainly registered and the certainly unregistered. The files collectively found far more of the unregistered than did any single file by itself. Two-thirds of those who were certain that they were not registered were located by at least one of the files, while 86% of those who said they were probably registered were matched. More than nine-in-ten (96%) of the certainly registered group were found in at least one file. But differences in match rates across the files were much greater for people in the two unregistered categories than for those who were certain they are registered. The collective results of the five files provide evidence that the unregistered are not completely invisible to commercial files of the sort examined in this study. This is reinforced when comparing the demographic and political profiles of the registered and the unregistered. As a group, the matched unregistered are similar to all unregistered, perhaps somewhat unsurprisingly since they constitute about three-quarters of the latter group. 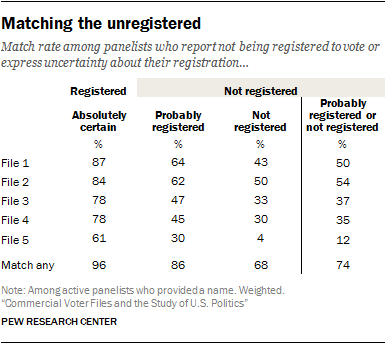 One difference that stands out is that the matched unregistered are significantly more likely to identify as Republican or Republican-leaning than are all unregistered panelists (and twice as likely to be Republican as the unmatched unregistered). This anomaly is evident in the collective group (matched to any file), as well as in each of the individual voter files. Research suggests it could be linked to the fact that those who are matched and unregistered tend to be wealthier than the unmatched. Although the files collectively cover a sizable share of the unregistered, the unregistered population who are unmatched to any of the files are quite different with respect to age, race and partisanship. Just over half (53%) of the unmatched unregistered are younger than 30, compared with 37% among those matched to at least one file (and 21% among all adults). Half of the unmatched unregistered (52%) identify as Hispanic, compared with just 21% among the matched cases. And just two-in-ten (19%) of the unmatched unregistered identify as Republican or Republican-leaning, compared with 41% of all unregistered. Collectively, these results show that, especially within a group known to be harder to match (the unregistered), there are demographic biases in the unmatched. These biases largely echo what we see in matching among the general public.